Good Morning, this is Capital Essence’s Market Outlook (the technical analysis of financial markets) for Wednesday August 15, 2018. Stocks closed higher Tuesday as the Turkish lira snap recent losing streaks. For the day, the Dow Jones Industrial Average rose 0.45 percent to close at 25,299.92, while the S&P gained 0.6 percent to 2,839.96. The Nasdaq Composite advanced 0.7 percent, closing at 7,870.89. The CBOE Volatility Index (VIX), widely considered the best gauge of fear in the market, fell about 10 percent to 13.31. One of the noteworthy developments in recent days has been the move in the financial sector. The group was under selling pressure in recent days as banks stocks were weighed down by a sharp drop in longer-term Treasury yields. After a strong run of outperformance in 2017 that saw the Financial Select Sector SPDR ETF (XLF) soared 20 percent, the ETF is holding near the unchanged mark YTD while the S&P rose more than 6 percent. Now the question is whether recent selloff is a pause that refreshes or it’s a beginning of something worse? Below is an update look at a trade in XLF. Our “U.S. Market Trading Map” painted XLF bars in green (buy) – see area ‘A’ in the chart. The first dominant feature on the chart is the rising trend line starting in early 2016. The second dominant feature of the chart is the downward trend since early 2018. The June downswing retested and respected support at the 23.6% Fibonacci retracement of the 2016-2018 upswing. The July rally pushed the ETF above the 2018 falling trend line, signify a bullish breakout and upside reversal. Trading actions over the past few weeks represented an orderly higher level consolidation. This is a bullish development, suggested that XLF will move up to test the early 2018 high as soon as it works off excessive optimism. 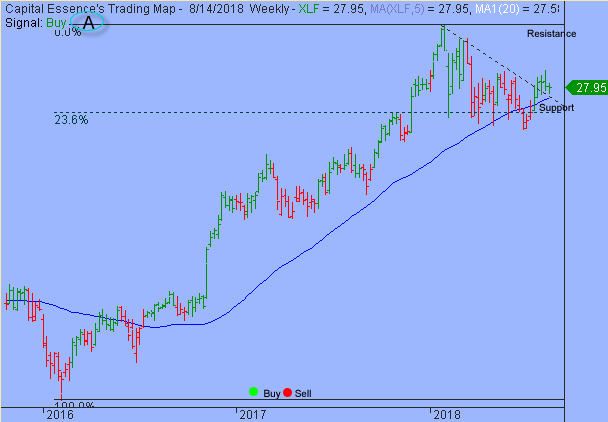 XLF has support near 27. Short-term traders could use that level as the logical level to measure risk against. S&P is basing sideways near the lower boundary of the pink band. That level was significant when the index climbed above it in early July. Money Flow measure flashed a weak bearish signal as it diverged from price action over the past months. The S&P took out the July high while the indicator set a lower low. This negative divergence suggested that the bears are more aggressive as prices off than the bulls were as prices ascended. For now, 2828 is the line in the sand. A close below it would trigger a new sell signal and a test of the trend channel moving average should be expected. Short-term trading range: 2788 to 2841. S&P has support near 2828. A close below that level has measured move to 2786, based on the trend channel moving average. The index has resistance near 2841. A close above that level will trigger acceleration toward the early August high near 2863. 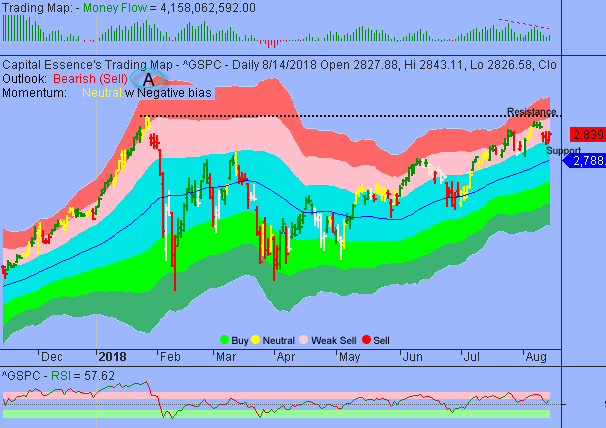 In summary, market is in holding pattern as traders are watching to see whether or not the S&P can hold above the lower boundary of the pink band. Money Flow measure had been deteriorated, suggesting that the support might not hold for long. A failure to hold above key price level means that long-term buying pressure has finally been exhausted. On balance, we remain near term negative for S&P as we believe market vulnerable to some downside retracement over the short-to-intermediate term.